The Portfolio is designed to house thin or loose/unbound items. 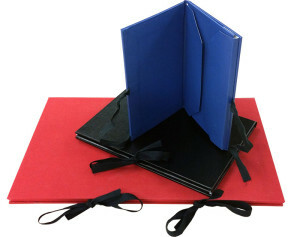 It is a four-flap enclosure enclosed in a hard cover. The flaps of the enclosure completely cover the contents and are lined with buffered paper. Portfolios can be secured with ties or with hook & loop button fasteners. 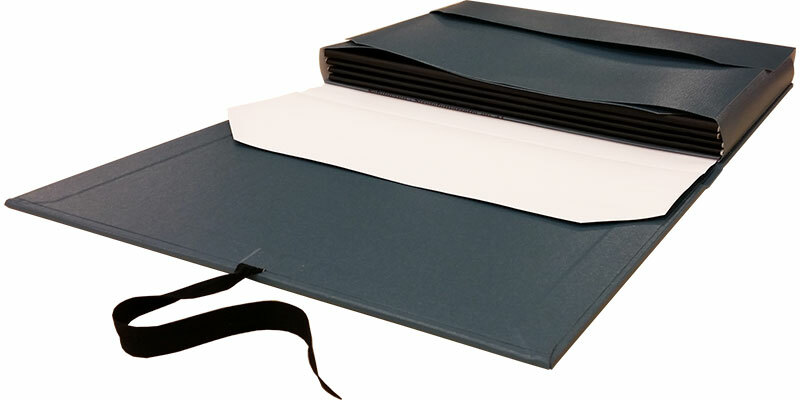 The standard portfolio is covered in durable F grade library buckram cloth, available in a variety of colors. Additional materials are available for an upcharge. View our selection. 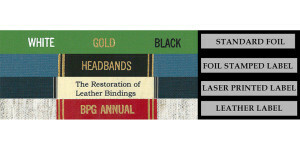 Titling is foil stamped directly onto the cloth. Minimum thickness for a portfolio is 3/16″. Every portfolio is handmade to fit each individual item perfectly. Email us the measurements using our convenient order spreadsheet. Worried about measuring your items correctly? View our Tips on Measuring, or contact us to arrange shipment of your items to our facility so we can do the measuring for you! We use high-density, acid free binder’s board to construct our enclosures. Our PVA adhesive meets library binding standards for long term stability. 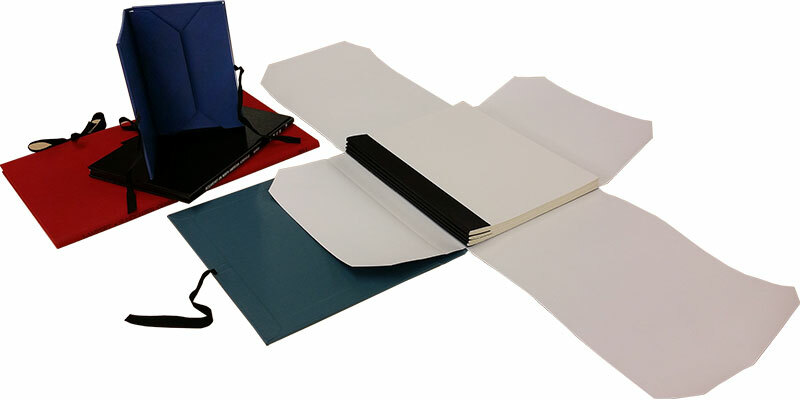 The portfolio is constructed of acid free board and durable F grade Buckram. The flaps are lined with archival paper that has a 3% calcium carbonate buffer. The custom fit of the portfolio helps protect items against abrasion, light and pollutants. Black cotton twill ties on the fore-edge hold our portfolios securely closed. Larger portfolios receive more numerous ties. High-shear acrylic adhesive make our hook & loop button closures an economical but strong closure style.